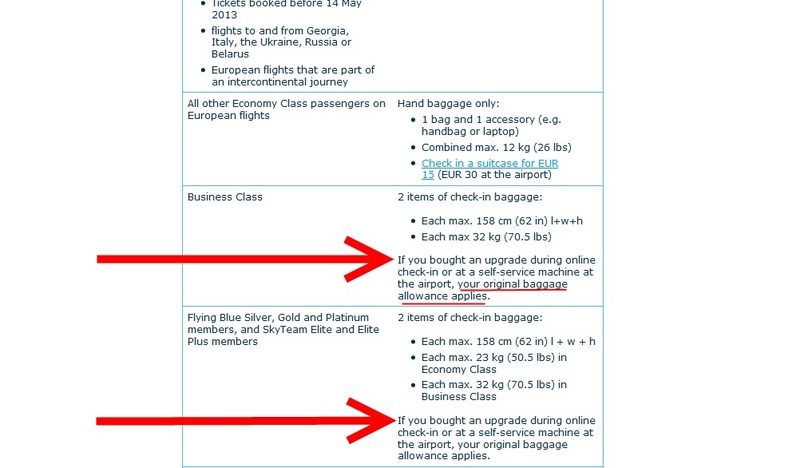 Frustrating Skyteam rules – (bag fees for example)! My choices to get to Sweden on Skyteam are somewhat limited. From Paris I have the choice of an Air France all coach regional partner or via KLM from Amsterdam and they have a pseudo-business class section. Of those two less than stellar choices I tend to pick KLM. Plus, the choice of AMS airport over CDG airport is a no brainer! The page where Delta.com “clearly” describes the bag rules is amazing. You almost need a slide rule to follow it all. However, the one plus side is that the class of service is a standard when it comes to bag rules and fees. Not so much with KLM as you can see above. KLM many times offers upgrades for sale either via online or at the airport check-in. 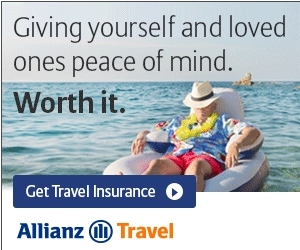 But notice if you do this, you are still bound by your original baggage allowance . I am sure there have been several shocked faces of flyers who, after they have just paid for the upgrade, are then asked for another fee for an extra bag. ← #FirstWorldProblems – too little #time & too many #points & 10 free Award Wallet+ codes! Consistency of Skyteam rules would be nice and provide competitive advantage over other alliances. On Friday, I am flying to LHR from MIA on a VA flight that I booked through Delta and have a seat on DL4387. I have a “W” class ticket for premium economy and on the return fly LHR to JFK on VA (with a DL flight number on my ticket) and then JFK to FLL on a DL bird where I have already been upgraded, do to the W class ticket. I want to know a couple of things about this. I am a GM with a Plat DL Amex and a PLAT Business Amex (not DL). 1) will I be able to get into the VA club? 2) should I be expecting 100 % MQM plus an additional 50% MQM for fare class booked? 3) would I get an comp upgrade on VA to upperclass, if available? I was originally flying the whole think as FLL ->JFK -> LHR and back, but had to push my outbound flight back 6 days and there were no premium economy seats out of JFK to LHR available. on a separate note, does it pay to try and do a SDC on the outbound to see if I can pick up additional miles and if so, who else has a Premium economy seat, I know that DL metal does not.